WordPress is the content management system (CMS) used by 24% of ALL websites. This kind of market share means that WordPress is a GREAT option for your business. 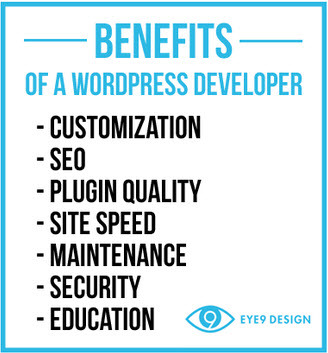 We offer fully customizable WordPress websites to meet the needs of your business. Many companies will offer you “custom” designs that are, in reality, just multi-purpose templates for purchase at $40-$50 a piece. We like to think that a custom site should be built for you; not you and a thousand other businesses. Many people don’t consider the value of their website’s CMS in relation to SEO. The fact is, web design and SEO are highly dependent on one another. We build our websites with SEO success in mind from the ground up. This means making sure your site comes with all of the tools necessary to obtain high organic search engine rankings. When we first look at a client’s website that is running WordPress, it is shocking the amount of plugins used. Plugins should be looked at as friends: Keep the good ones, and get rid of all the ones you don’t need. Bad plugins can create security issues, site performance issues, and functionality issues. When you choose us, you can be sure that your site will run only the plugins that are required for success. Both humans and Google hate slow-loading websites. If your WordPress site is built using a multi-purpose templates, page speed load times will suffer due to unnecessary plugins, scripts, and large files. We ensure your site passes all site speed quality measures so that both human users and Googlebot get the best possible experience. Your time is valuable. You’re busy running your business. You shouldn’t be expected to keep up with all the necessary maintenance that goes into running a website. We are focused on making sure your website continues to perform properly and serves your company’s goals. Unfortunately the internet is filled with people who want to unlawfully access your website. Hackers and spammers crawl the web looking for any vulnerabilities in your site that can help them with whatever goals they have in mind. We employ the optimal tactics to help protect your site from unwanted intrusions. It’s important to know how to use your website once it’s in place. Too many companies will build you a site, and then charge you for countless hours to make changes you could have done yourself. We make sure you have the tools and knowledge to make changes to the site as needed. 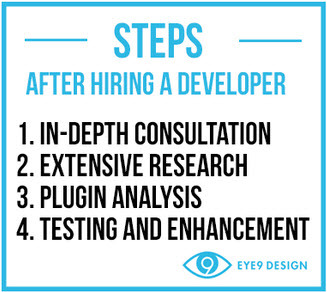 What’s It Like to Work with Eye9? Since your brand and your business is unique, we want to know everything about it. More importantly, we want to know everything about you and your customers. All of our work is done with your business goals in mind. We can’t be successful without knowing the ins-and-outs of your industry, the past performance of the website, your business trends, and anything else relating to your operations. Our goal is to make you feel like we work for your company, and have a comprehensive understanding of your challenges and your goals. We like to meet in the middle with plugins, meaning, we like to match up plugins the plugins that we recommend with the functionality your business and customers need. If you don’t need ’em, and your customers don’t need ’em, we won’t use ’em. This is the most important step in WordPress development. Basically, we’re not happy until your happy. We will meet with you to test the functionality of the site, the design aspects, the imagery/branding, and everything else relating to the launch of the new site. You should never end up with a website you aren’t satisfied with, and we’ll make sure that never happens. Ready for an Awesome New WordPress Website? We believe that your business deserves a beautiful, custom, high-performance WordPress website without going bankrupt to get it. Give us a call at 720-229-0703 or fill out this short contact form to request a quote today. We’re pumped to show you what we can do.